For this series of comedic short films, we developed a web site with one primary objective: super-low load time. Once you’ve loaded the main page, you’re done. Click any other section, and it quickly slides into view. Want to play one of the videos? Just click one of the custom screenshots and the layout dims to focus on the film.With its narrow, vibrant design, it looks even better on mobile phones. Pull it up on an iPhone and the animations evoke the familiar sliding motions of many apps. 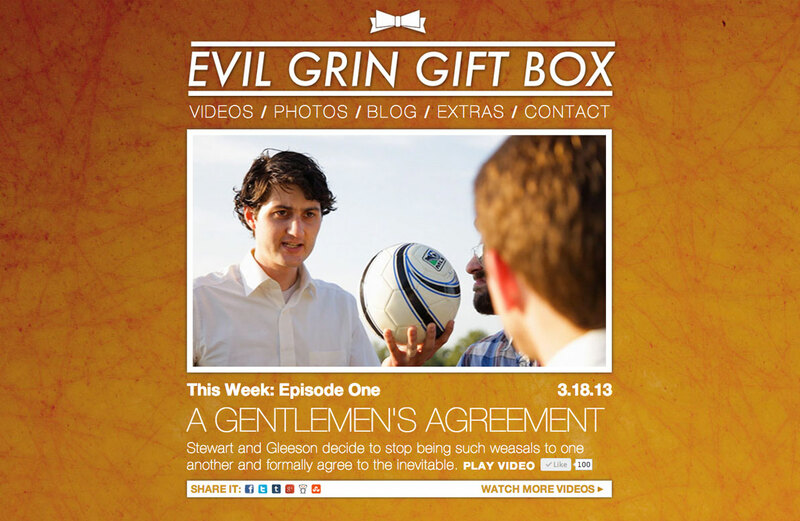 Evil Grin Gift Box is an ongoing series of short films with a bent toward dark, absurdist humor. Some of them are directly related through recurring characters, while others are indirectly connected through common themes. Members of Shrieking Tree write, direct, edit, act in, and compose music for them.